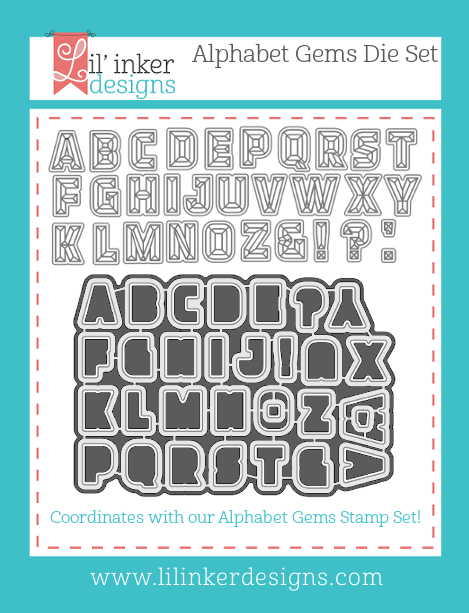 I showcased the new Alphabet Gem Dies that coordinate with the previously released Alphabet Gems Stamp Set. I started with a custom ink smooshed orange and pink watercolored panel with a touch of pearlescent sparkle. This was adhered to a white card base. 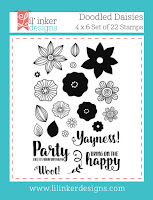 I them stamped a sentiment from Girl's Best Friend Stamp Set onto a white card panel, that also had the rest of the sentiment cut from Alphabet Gem Dies. 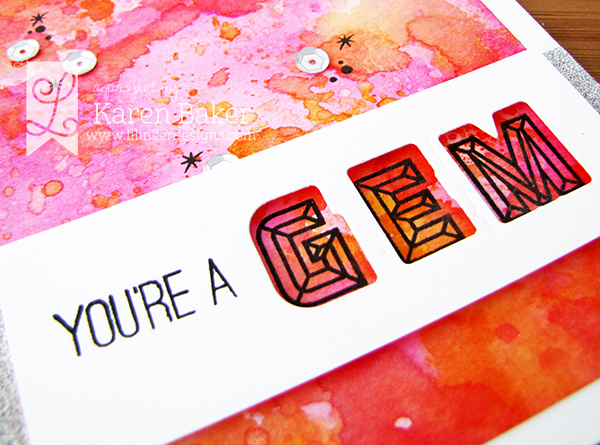 I carefully stamped letters from the Alphabet Gems Stamp Set onto my colored panel, matching up with the die cuts. I finished the card by mounting the sentiment panel to the card with dimensional adhesive, added some sequins and black inked stars from Girl's Best Friend Stamp Set. 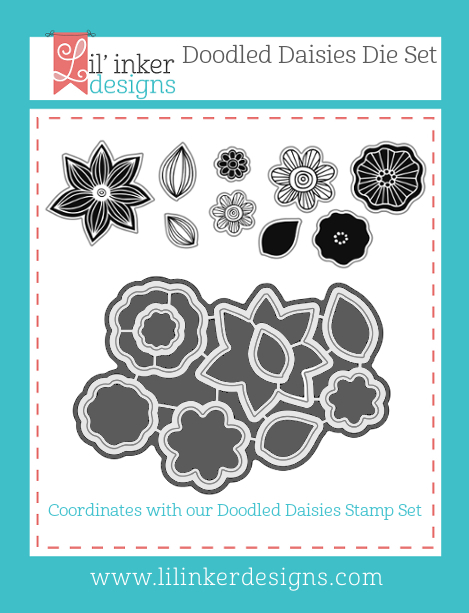 My last card for this release showcases the new Doodled Daisies Stamp Set and coordinating Doodled Daisies Dies as well as the Everyday Word Tag Die Set. 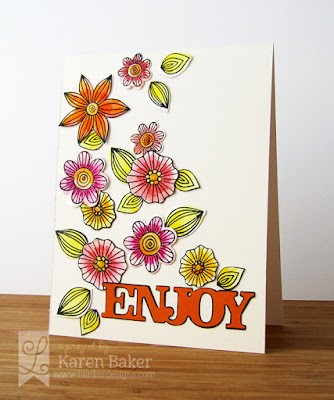 For this card, I stamped and watercolored a bunch of the blooms and leaves from Doodled Daisies Stamp Set and die cut them out with Doodled Daisies Die Set. I adhered them to a vanilla card base, some with dimensional adhesive. I then added glossy accents to a few of the doodled centers for a fun look! 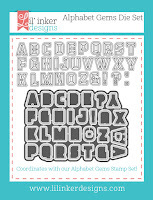 I finished the card by die cutting a sentiment from the Everyday Word Tag Die Set, once again cutting off the tag part. I adhered this to the card base and outlined the die with black marker. I love how this little detail makes the whole card flow together! 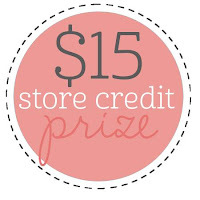 Also, the Stitched Gift Card Holder Die is back for a limited time! The size is slightly improved (a bit larger for more wiggle room and easier folding...). These are just perfect for your holiday gift-giving! 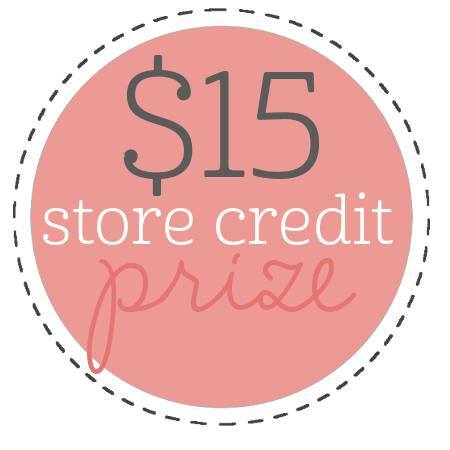 Since I'm the last on the hop, I'm going to send you to the Lil' Inker Design Store now so you can check out and purchase for yourself all the awesome new products that were showcased on the hop today! 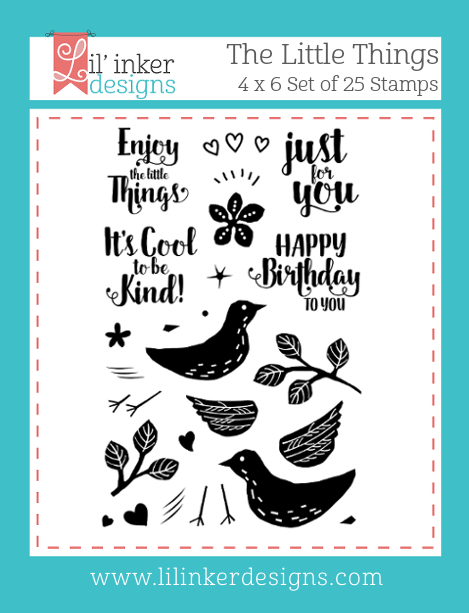 Welcome back to the second day of Lil' Inker Designs July 2016 Release Showcase! 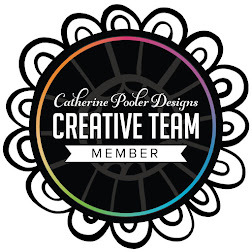 I hope you've enjoyed seeing all the new products in action as much as I have enjoyed working with them! 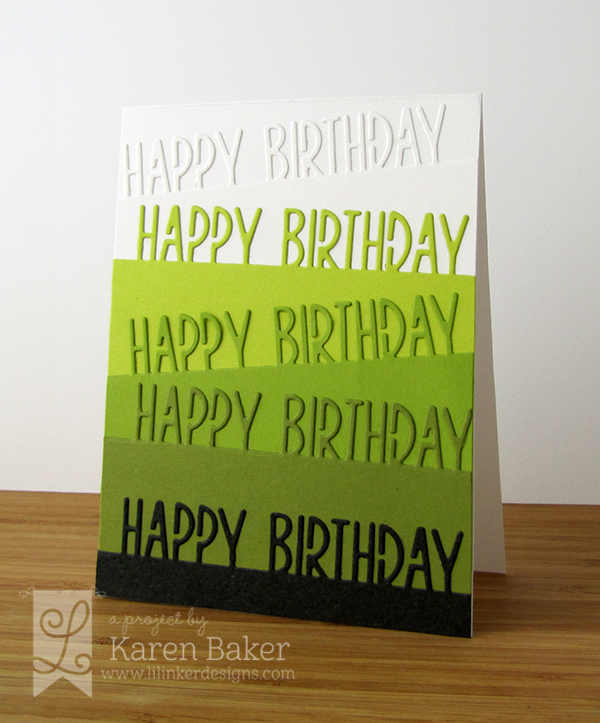 I had a lot of fun picking out the colors of solid cardstock and making my first card for today. I was so easy and quick! I die cut five of the new Happy Birthday Border Die from white, three shades of green and black cardstock. These were adhered to a white card base in a layered, wonky fashion. A perfect masculine card! 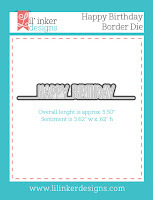 The Happy Birthday Border Die pairs wonderfully with Clean Lines: For the Guys Stamps and Dies as well! One could easily make this a touch more feminine too using many of the flower die sets available from Lil' Inker Designs as well, like the Perky Posies Die Set. 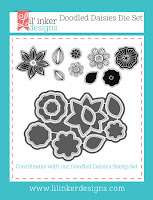 My next card also features a new product combined with a really fun, previously released stamp and die set. Still lovin' how Lil' Inker Designs products work so well together! 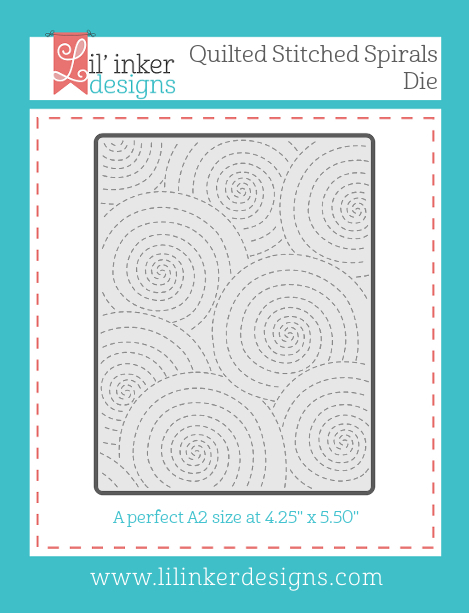 I started with a white card base and die cut a stitched rectangle frame from the Stitched Mats: Rectangles Die Set. 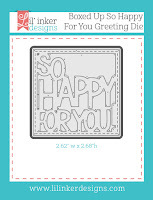 I then die cut a sentiment panel from the new Boxed Up So Happy For You Greeting Die. 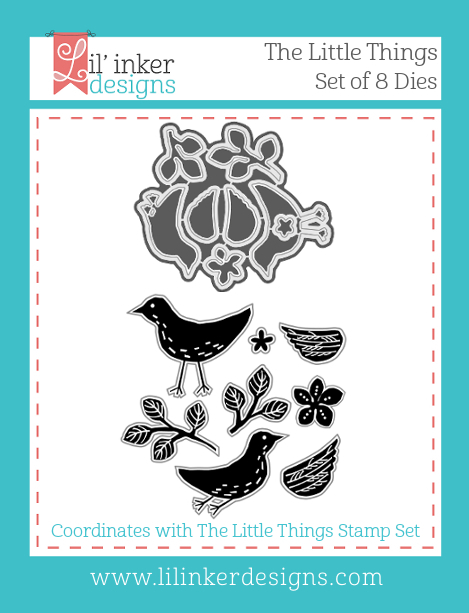 (This die is perfect for shaker cards, by the way!) 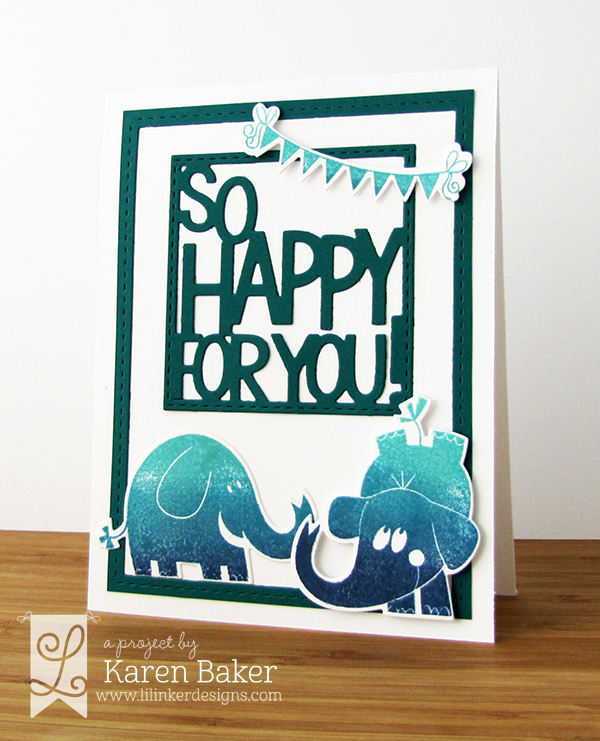 I finished the card with some ombre inked and die cut elephants and banner from Party Pachyderms Stamp Set and coordinating Party Pachyderm Dies. Such an easy and happy card today that really makes me smile, how about you? It is with pleasure that I get to send you to the talented Chrissy Larson's Blog as the next stop along the hop. 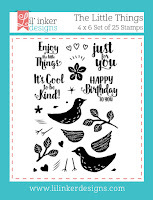 I hope you get a chance to visit the Lil' Inker Design Store now as all the NEW JULY 2016 RELEASE products are already up at the store! 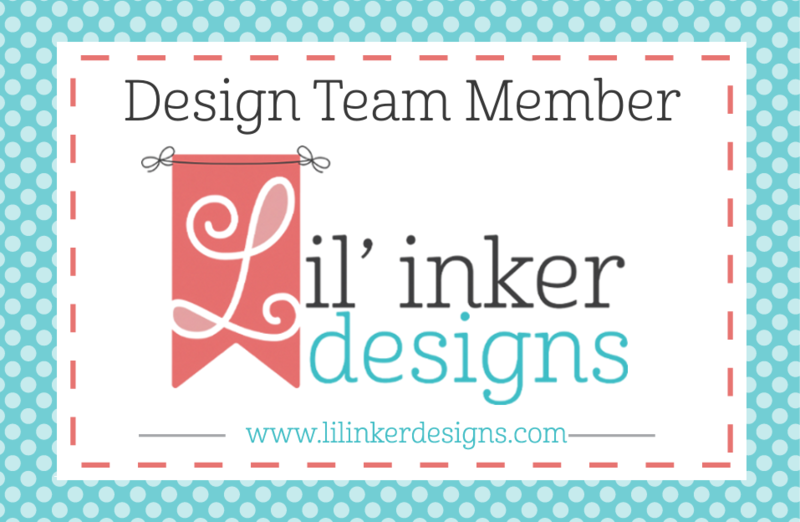 It really doesn't surprise me that Lil' Inker Designs just released some awesome and unique new products, I adore this company, the owner and their products. 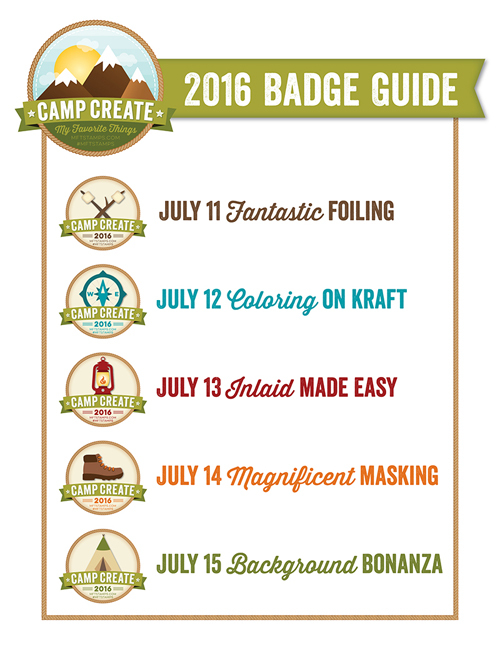 Today is the first of three days of the Lil' Inker Designs July 2016 Release Showcase! My first project features the seriously pretty and versatile The Little Things Stamps and coordinating The Little Things Dies as well as the Fringed Scalloped Circle Dies. 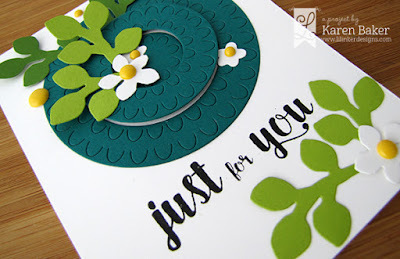 I started with a black stamped sentiment from The Little Things Stamps on a white card base and then die cut a series of leaves and flowers from The Little Things Dies with various shades of green from the leaves and white for the flowers. 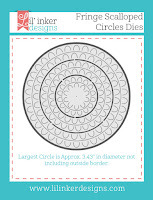 I also die cut all of the circles from the Fringed Scalloped Circle Dies in a deep teal color. 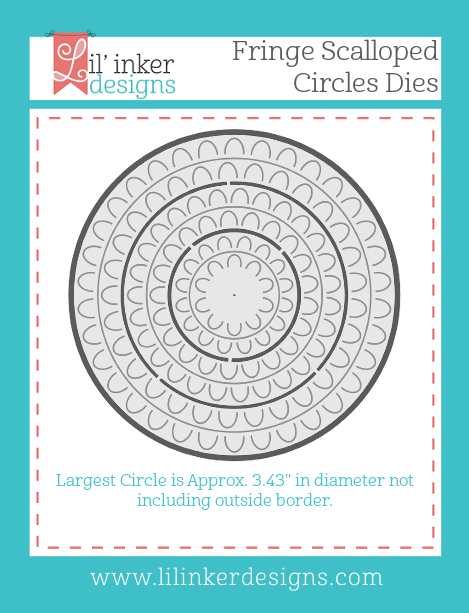 These were arranged onto the white card base, with the middle circle set adhered with dimensional adhesive. I then arranged the vines and flowers around the fringed circle and sentiment, and finished with yellow accents. My next card also features a couple of products from the new release, and I'm still in awe on how Lil' Inker Designs products work so well together! 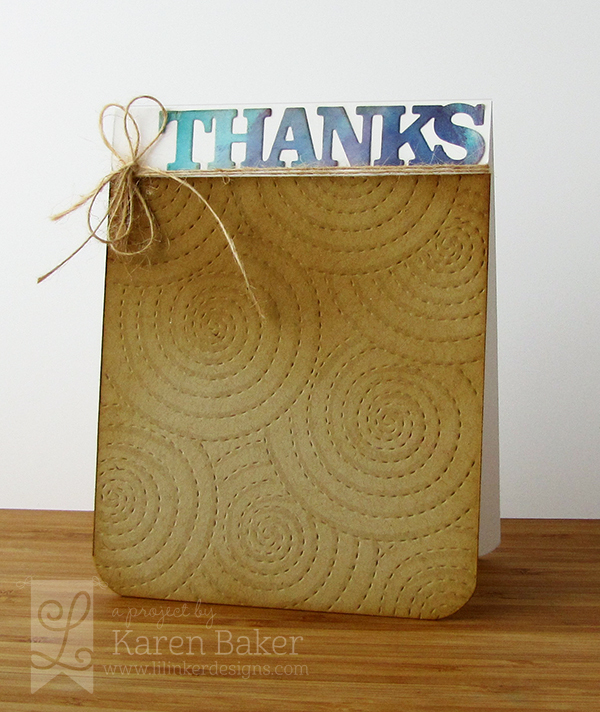 For this card, I embossed an distress inked kraft panel with the Quilted Stitched Spirals Die. I further outlined the spirals with a warm gray copic marker. I adhered this to a white card base. For the sentiment, I painted a watercolored panel with shades of blue and purple and then die cut a fun sentiment from the super versatile Everyday Word Tags Dies. 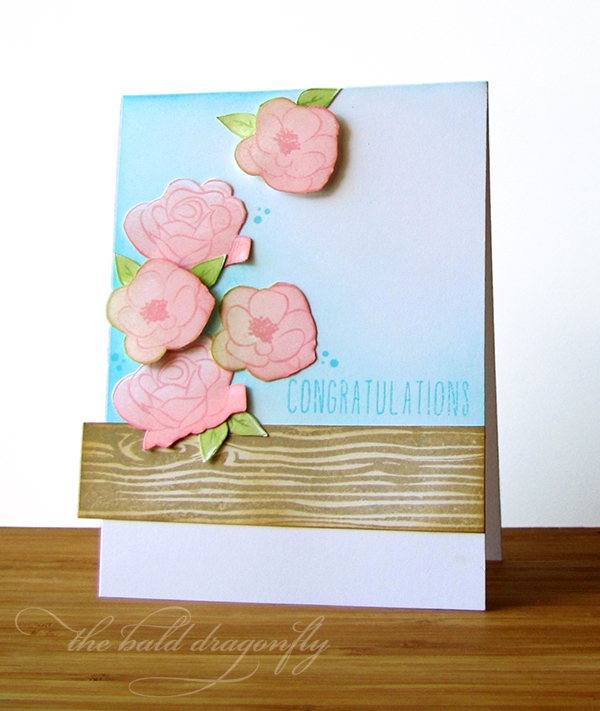 I simply trimmed off the tag part before adhering the die cut to my card! I finished the card by rounding the bottom corners and adding a loose double bow of burlap string. 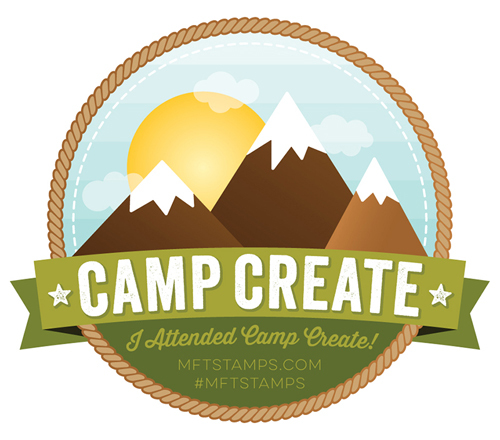 The MFT Camp Create has been a lot of fun, and I was able to make a card for each day of the camp...of which I'm going to showcase them all in one post today. My first card was my favorite of the five, featuring Magnificent Masking. I started with a brick red card base and stenciled a brick pattern onto it with the Small Brick Wall Stencil. 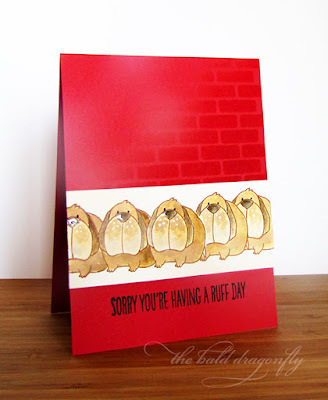 Then on a vanilla cardstock panel, I masked a few cute pups from the You Make My Tail Wag Set, colored them with distress ink and adhered this panel onto the base with dimensional adhesive. I finished the card with a stamped sentiment. 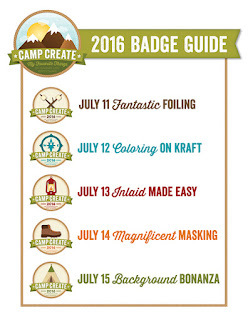 This next card is for the Coloring on Kraft session. 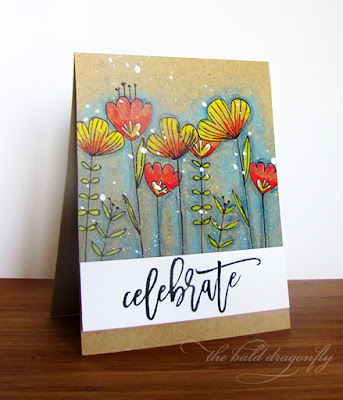 I stamped and colored with pencils some blooms and leaves from Sketched Blooms and splattered with some white acrylic paint. 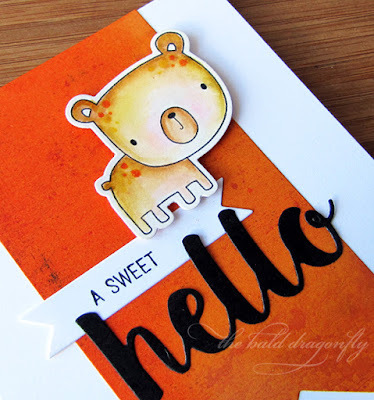 I stamped a sentiment from Right at Home's Script Greetings onto a white panel and then adhered this to the card base with dimensional adhesive. My third card features a custom, stamped background for the Background Bonanza Session. I stamped the smaller images from Magical Unicorns onto a cream cardstock panel with chocolate ink, then colored them in with a comic book inspired fashion with Copics. I added a bit of sparkle with Wink of Stella. 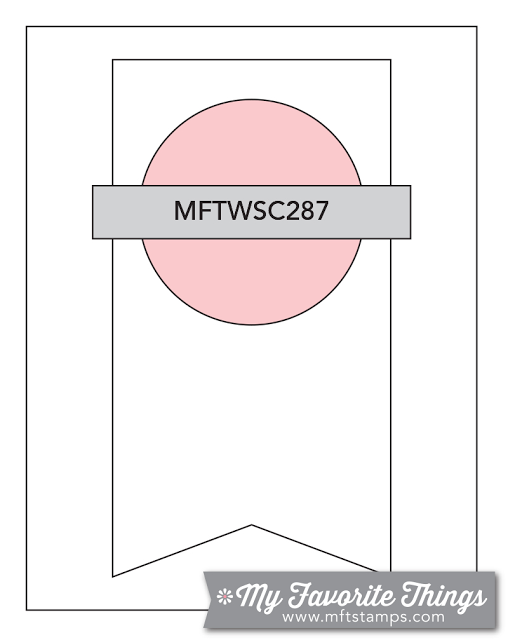 Then this panel was adhered to a kraft cardstock base and I stamped a fishtail banner sentiment from Magical Unicorns. This next one is for Inlaid Made Easy. I inked a blue piece of cardstock and added some pearlized splatters. After the panel dried, I die cut the butterflies and elephant from Adorable Elephants. 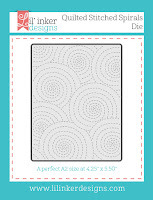 Then I die cut the same from white cardstock, stamped and colored them in with zigs. The blue panel was adhered to a white cardstock base, and I inlaid two butterflies and the elephants The middle butterfly was adhered with dimensional adhesive. I finished the card with a banner sentiment and a few iridescent sequins. This last card is for the Fantastic Foiling Session. I started with affixing three strips of double-sided adhesive onto a white cardstock panel and covering with gold foil. 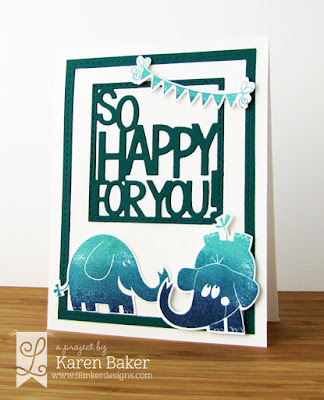 I then stamped a sentiment from Adorable Elephants. The panel was affixed to an aqua card base. Then I stamped, colored and die cut a unicorn from Magical Unicorns. I attempted to add foil to the hooves and horn. 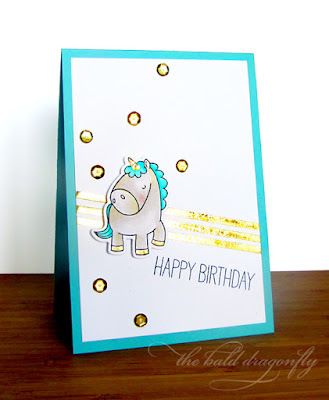 I finished the card by affixing the unicorn to the card with dimensional adhesive and gold sequins. Whew, that's a bunch of cards! Ooph, it is a hot one outside in central Wisconsin today. I think we get spoiled by our mostly mild, humid free summers (but have to make up for it with the nasty cold winters). 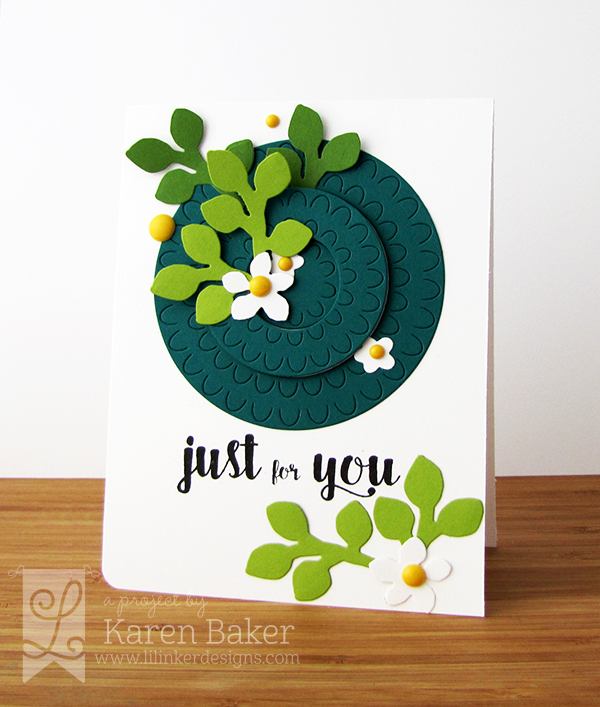 I'm stopping in quickly to share a card I made that was inspired by the photo over at the Little Tangles Challenge #70: Inspired by Pinterest. I stamped and die cut the cutie pie girl and her pup from Neat & Tangled Better Together Stamp Set and colored her with Copics based on the colors and patterns from the inspiration picture. I grounded her onto a die-cut strip of grass, but before doing so, I added a blue chevron stencil design to the background, to bring in some of the blue from the photograph. As the heat index rises here in Wisconsin, many of my early summer blooms have come and gone. Among my favorites were the pale pink peonies. I started working more towards a perennial garden a few years back and eventually want a garden that blooms spring through late fall. 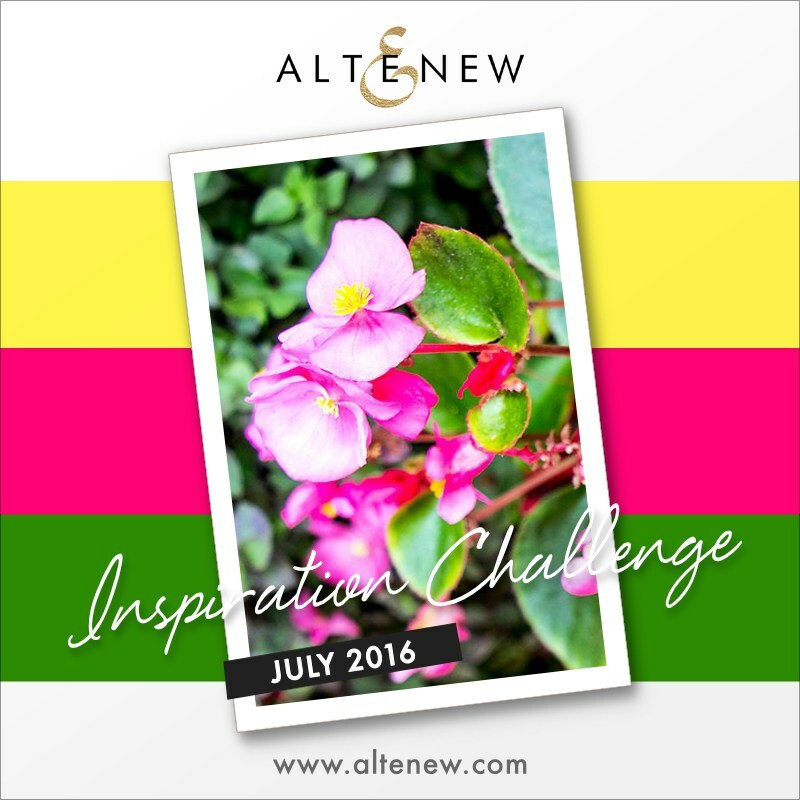 I was inspired by the beautiful picture for the July Altenew Inspiration Challenge. 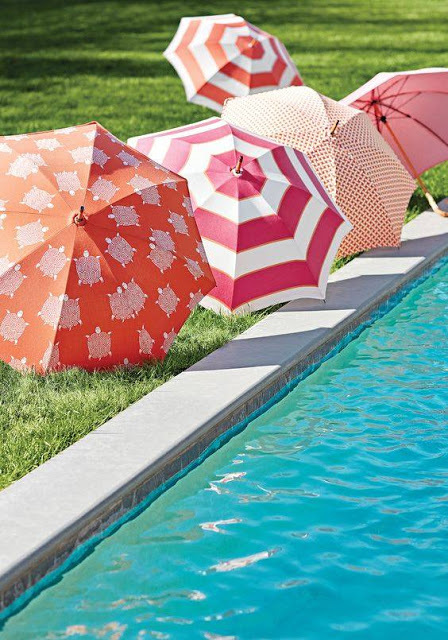 Those bright, pink, bold blooms with the spots of yellow... I stamped and masked and stamped the large bloom from Beautiful Day with red ink onto Bristol Smooth Cardstock, and then masked and stamped in green the leaves from the same set. I watercolored them with Zig Markers, added a few splatters and mounted the panel to a white cardstock base after the painting was dry. I did border the image with some black and white strip images to tie in my sentiment. If you like I can give you a big bear hug. It will make you feel snug as a bug in a rug. As soon as a bear hug comes your way, Find yourself a good friend and give it away! This is my last entry for the CASometry Challenge 2 Take 5. 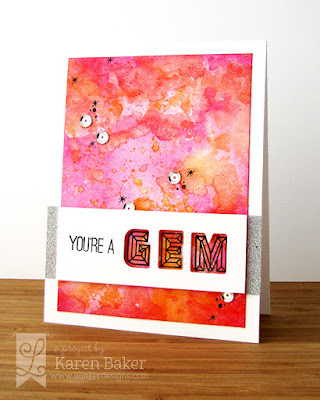 There was a twist in this last challenge to CASE a pinned card from the CASometry Pinterest Gallery, so I chose to case this card. I was drawn to the ombre background, single image and bold, die cut sentiment. 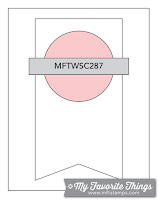 I also added the fishtail banner and a banner sentiment to follow the current MFT Stamps Sketch Challenge #287. 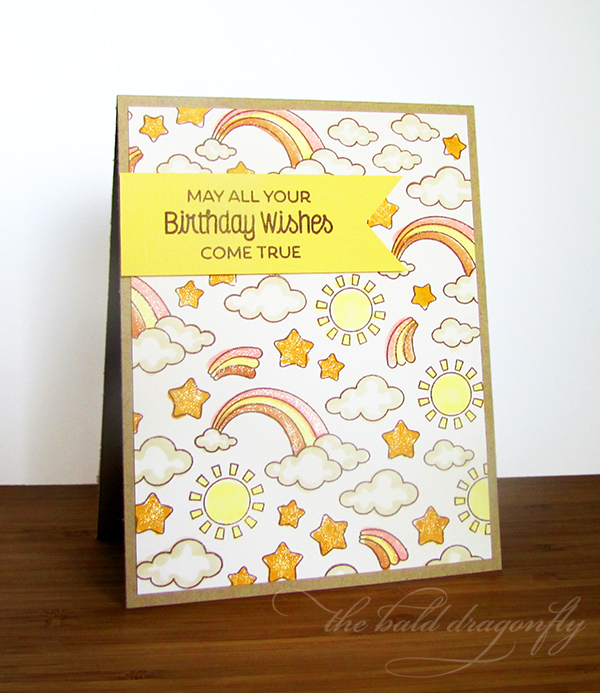 I started with a die cut patterned paper background, and inked the edges with orange on the left, yellow on the right, to mimic the ombre look of the CASEd card background. I then die cut and stamped the sweet bear image from Forest Friends onto Bristol Smooth Cardstock and colored him in with Zigs. 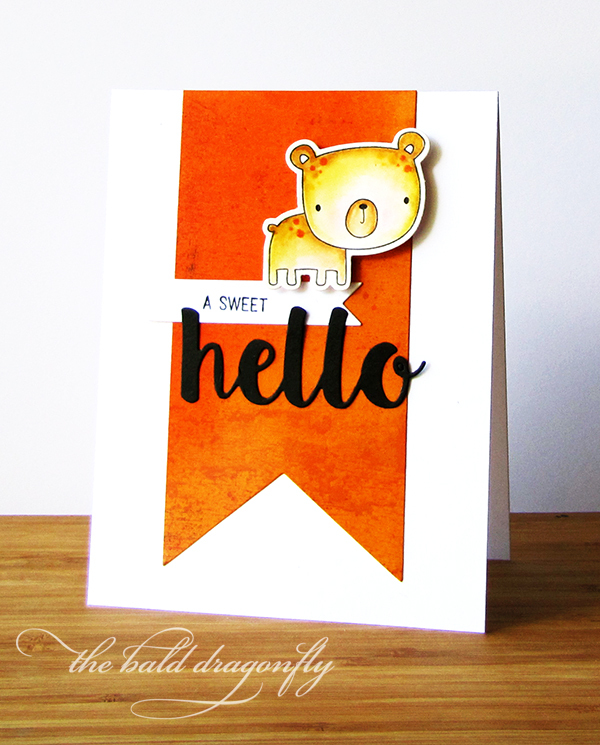 I added a few dots in various shades of brown, yellow and orange for additional texture, and cuteness! 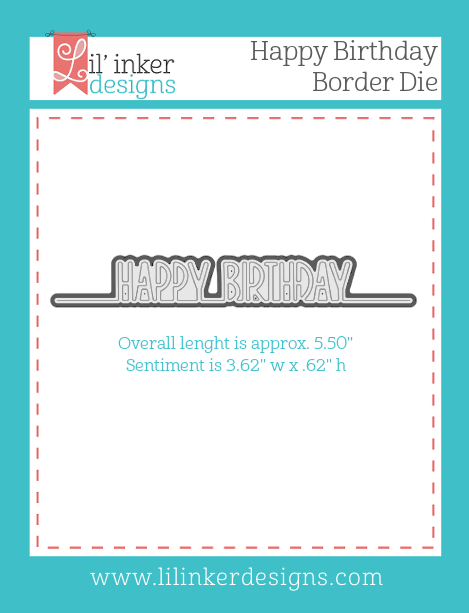 I then die cut a banner sentiment, stamped a greeting and then adhered that to the large fishtail banner. A large die cut from the Hello There Dienamics was cut from black cardstock and adhered it to the fishtail banner. The bear was affixed with foam dimensionals, and then banner added to a white cardbase. This was a great challenge to partake in. I've enjoyed making all my five cards and hope to do this idea with my other neglected stamp sets! Sigh. I don't think that I will ever tire of the natural beauty in woodgrain and blooms. Each piece of wood, each flower, is so different and unique. Sharing my last card for the Winnie & Walter Share the Love featuring Essentials by Ellen Day 5 Challenge: Mood Board before time slips away from me this holiday weekend. 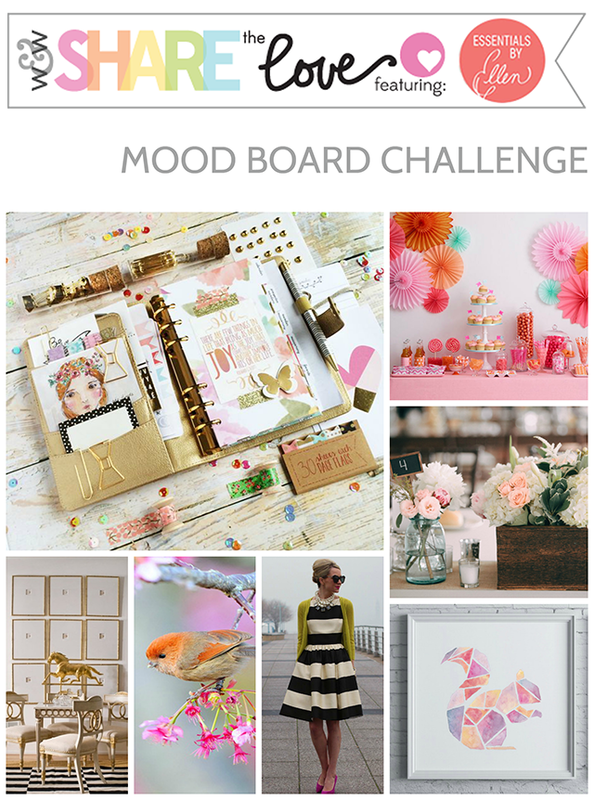 I was inspired by the middle right picture and attempted to recreate the look of the woodgrain and blooms. I started by slightly inking the sides and some of the center of a white card base with aqua ink. I them stamped and trimmed a woodgrain panel to be slightly larger than my card base (stamp is from a retired Wplus9 stamp set), inked the edges and adhered this to my card base. I stamped a sentiment from Essentials by Ellen 12 Days Companion Greeting Stamp Set in the same ink as the inked background. 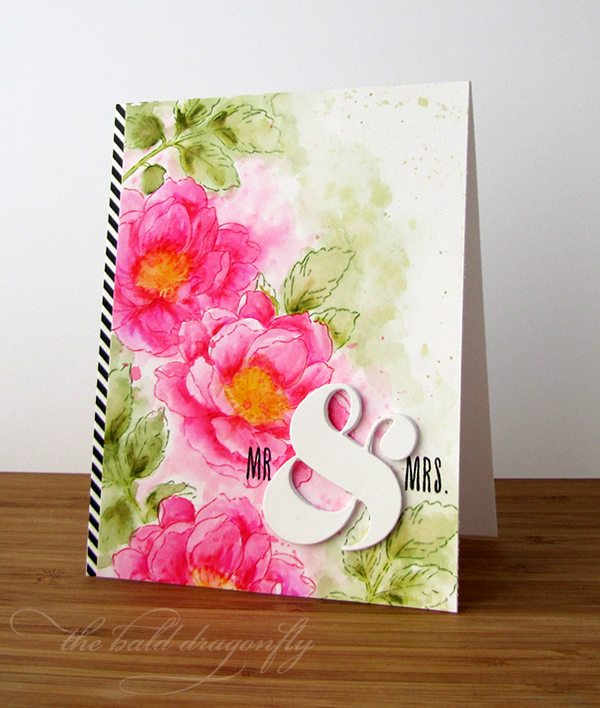 After stamping and fussy cutting both blooms from Winnie and Walter's The Big, the Bold and Extras Stamp Set and slightly inking their edges in pink and green, I adhered them to the card base-some with glue and others with dimensional adhesive. I then stamped and inked a few leaves, fussy cut them and added them to the card as well. 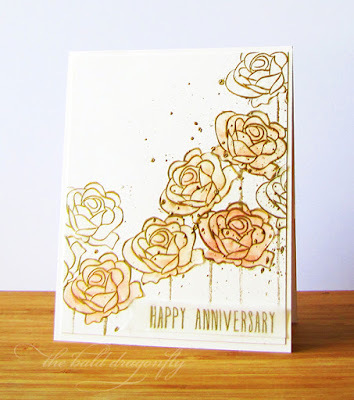 I finished the card by adding a few stamped dots, also from The Big, the Bold and Extras Stamp Set. As always, thank you for taking the time to visit and comment. I hope you all have an amazing weekend! 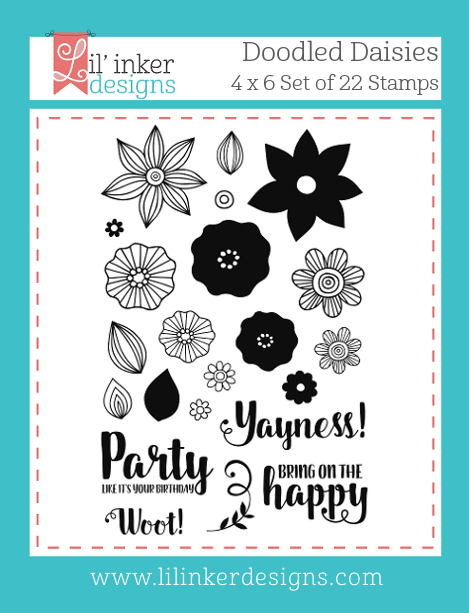 I've had a lot of fun creating the same two stamp sets these past few days...I think I need to revisit all my stamp sets and do the same. 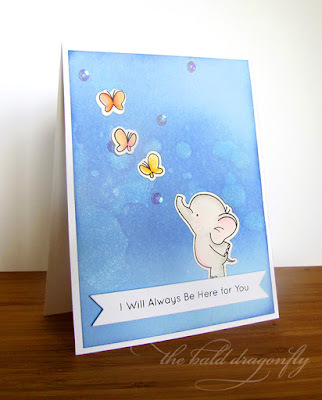 I'm playing along with the Winnie & Walter Share the Love featuring Essentials By Ellen Day Four Transparent Challenge. 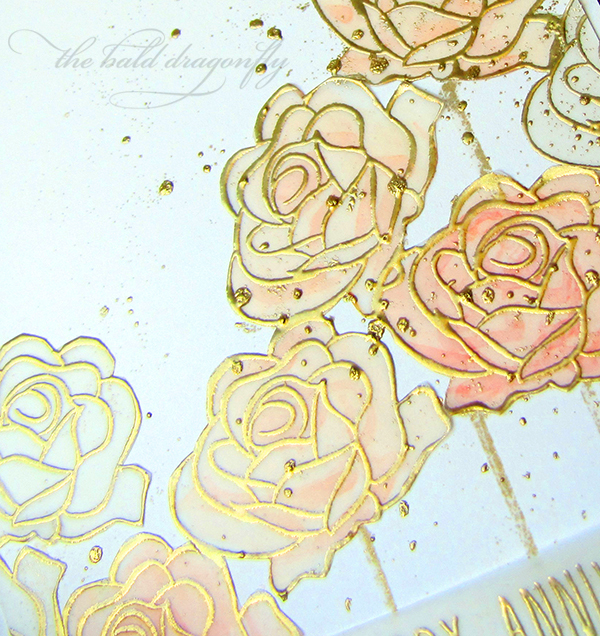 I started by heat embossing in gold onto vellum a series of roses from Winnie & Walter's The Big, the Bold and Extras Stamp Set. I fussy cut them and then on the back I colored with various shades of pink and blush alcohol markers. I then die cut a banner from vellum and heat embossed in gold a sentiment from the Essentials by Ellen's 12 Days Companion Greetings Stamp Set. Once I had the arrangement finalized for my card, I drew some stems with a Versamark Pen and then heat embossed in gold as well. I was able to adhered the roses and the banner with a light touch of glue onto vanilla cardstock. 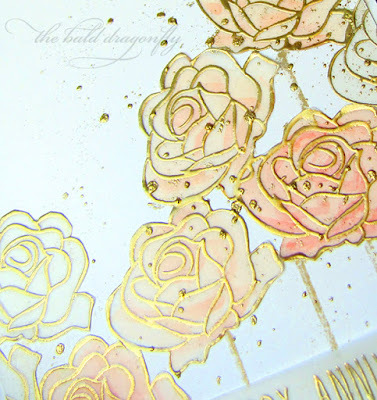 I felt that the card needed a bit more detail, so I splattered some watered down glue onto this panel, then heat embossed the splatters with gold embossing powder. I finished the card by adding the sentiment banner and adhered the panel onto a matching vanilla card base.